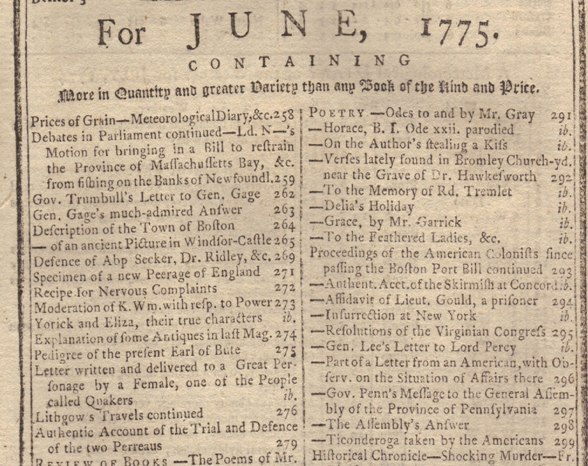 "Shot Heard Round the World"
The full text of a letter by Connecticut Governor Trumbull demanding answers from General Gage on the unprovoked atrocities committed by his troops as Lexington and Concord. 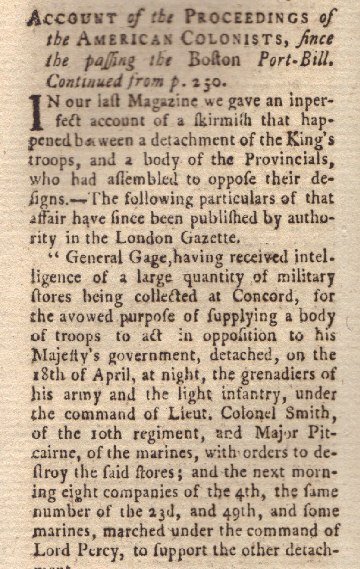 The full text of the reply of General Gage to Governor Trumbull asserting that his troops are merely on the defensive and that his troops acted properly at Lexington and Concord and suggesting that the British offer to let the American colonies tax themselves may be a basis for resolving the conflict. "Gen. Gage has given positive orders that no person shall go out of Boston." "All the colleges in New England, having been voluntarily resigned by the students, are turned into barracks for the Provincial troops." 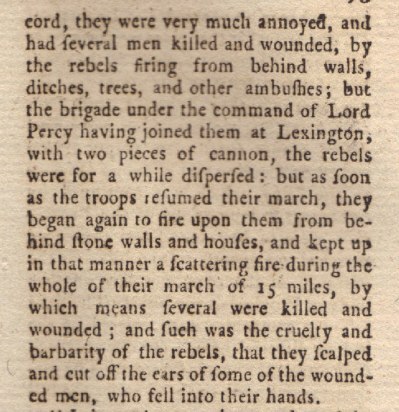 Several reports of the increasingly restive state of the American colonies following the reports of the battle at Lexington and Concord, including an insurrection in New York City. 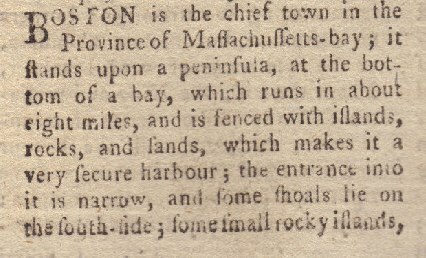 A description of town of Boston in 1775. Below are some pictures of those topics starting with the index on the title page showing the extensive coverage of the American conflict. 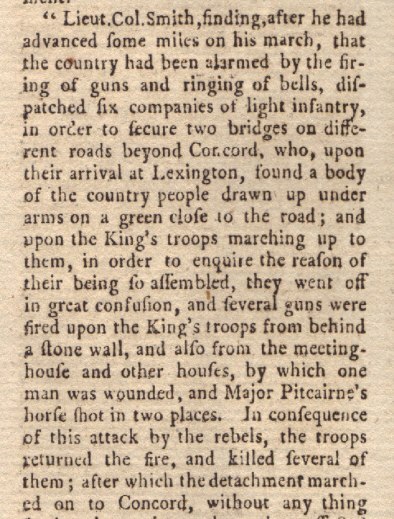 Below are three excerpts from the British report of what happened at Lexington and Concord. 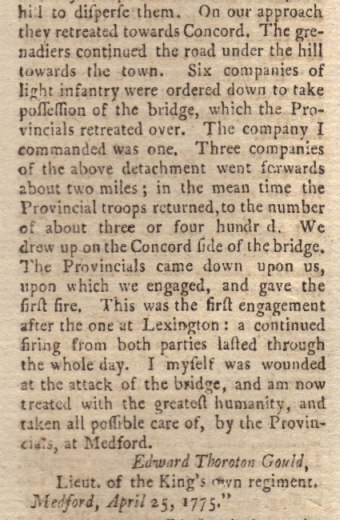 Included in the issue, shown in part below, is the full text of an affidavit by a British soldier captured at Concord, that was used as evidence of the American view of the conflict. Below is a portion of the letter from Governor Jonathan Trumbull of Connecticut to General Gage and the start of Gen. Gage's reply. 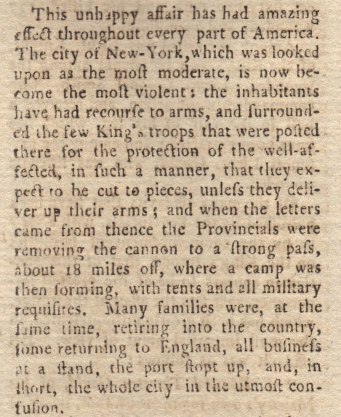 Below is a report on the impact of reports of Lexington and Concord, including an armed insurrection in New York City which resulted in the capture of British cannons. Below is an excerpt from the first report of the capture of Fort Ticonderoga by Ethan Allen's Green Mountain Boys and Benedict Arnold. The seizure of Ticonderoga was later critical to kicking the British out of Boston after young Henry Knox (later General Knox) conceived of and executed a bold plan to drag the cannon across New York and Massachusetts in the middle of winter to invest Dorchester Heights. Below is the start of the description of Boston in 1775. The events at Lexington and Concord were memorialized by Ralph Waldo Emerson in 1836 in his poem "Concord Hymn" in 1836 for the dedication of the Obelisk, a battle monument in Concord, Massachusetts that commemorated the contributions of area citizens at the Battle of Lexington and Concord. This wonderful issue gives rich full text of reports, letters and accounts of the Battle of Lexington and Concord and the impact of the battle in energizing opposition to British rule throughout the American colonies.